I saw the excitement for The Nightmare Affair on twitter but I decided not to jump on it because I didn't know how good it could be, so now I'm not disappointed. It sounds really middle of the road, although the very beginning reminds me of Monsters Inc.! Yes! We pretty much felt the same way about both of these. You know I agree about Perfect Scoundrels, it WAS the best one yet, and apparently, there will be mooooore! I DNF-ed The Nightmare Affair for the same reasons you did. It felt like a complete waste of my time and I figured I have better things to read. I really wanted it to be original and special but oh, well, what can you do. 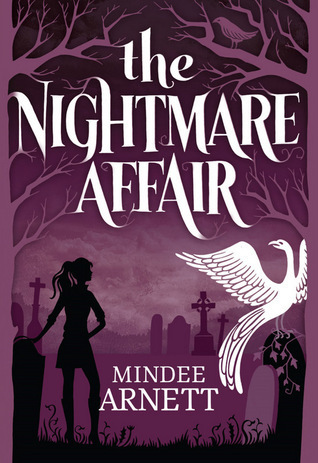 I finished the Nightmare Affair and gave it 3.5 stars. I'm on the blog tour for it next week. But I did find it disappointing. Having met the second guy, he wasn't impressive and it was a very predictable read, but was slightly redeemed by the ending. I will pick up the sequel when it comes out, and hopefully things will have improved. You took the words right out of my mouth. After seeing the lovely cover and reading the quirky synopsis I was really looking forward to The Nightmare affair, but I was left sourly disappointed. The dialogue didn't really work for me and tbh I was quite bored after the first few chapters. I enjoyed The Nightmare Affair more than you did, but I was also a little disappointed. I suppose as it was one of my most anticipated releases this year, I was expecting it to blow me away. Sorry you couldn't finish it. :( I haven't read your review of Perfect Scoundrels as I'm starting the series soon, but I'm really glad to see a high rating! I have The Nightmare Affair as well, so this is disappointing news. Although, sometimes it's nice to have a light predictable read. Yet, who has the time to waste? Everyone seems to have enjoyed the latest installment of Heist Society. I haven't yet picked up the series, and to be honest, I probably won't, but glad to see you loved it. It says something if a book distracts you enough you put off other things to finish it. Darn homework! ;) Great reviews Keertana, as usual. I'm sorry to hear about The Nightmare Affair. I have that one to read. Cliches do annoy me quite a lot so I will probably be annoyed, but I'm willing to give it a try. I've yet to read a book by Ally Carter, but I definitely need too. Especially since I've heard such brilliant things about Heist Society. Lol I love your definition of a "mini review." Your reviews are always so awesome Keertana.I liked your review for The Nightmare Affair a lot. I'm sorry that you didn't enjoy this one. I guess I liked it a bit more than you did, but I do agree with you about the dialogue and the characters. Oh bummer about Nightmare Affair. I just downloaded that one, but I have a feeling it's going to be a miss for me too. Reading Perfect Scoundrels now and loving it so far—I love seeing the more vulnerable side of Hale too. Great mini reviews! Perfect Scoundrels was probably my favourite book in the series yet and although I felt bad for Hale his grief added a new layer to these usually fun light hearted books, lovely review Keertana! What a shame! I was looking forward to Nightmare Affair because it had such a unique premise but now I don't think I want to read it. I've had enough of typical YA paranormal romances. I need something different. And I really need to read something by Ally Carter. I will have to get on that. Glad you liked this one! Great reviews, Keertana! I was really looking forward to The Nightmare Affair but after all the mixed reviews, I'm wary. I'm really glad you enjoyed PS though! I totally agree about characters getting more depth. Ah so sad about The Nightmare Affair! The cover is gorgeous and idea sounded so amazing but oh well. Perfect Scoundrels is a book I am so scared to read! I'm not sure how I feel about it ending (this is the last book in the series, right?) so I've been worried about reading it. The romance is always the most important part of the book and it's really bad that the romance here wasn't good. Off my to-read list! Shoot. I just skimmed The Nightmare Affair after seeing your rating. All I can say is that I really hope I like it more. I already have it, so I'll be trying it anyway. I'm so happy to hear Perfect Scoundrels is the best yet. While I have enjoyed the books in the series I always felt like the characters were lacking something. And the romance was so frustrating cause it never went anywhere. So I'm excited to read this one since you say it's the best yet.